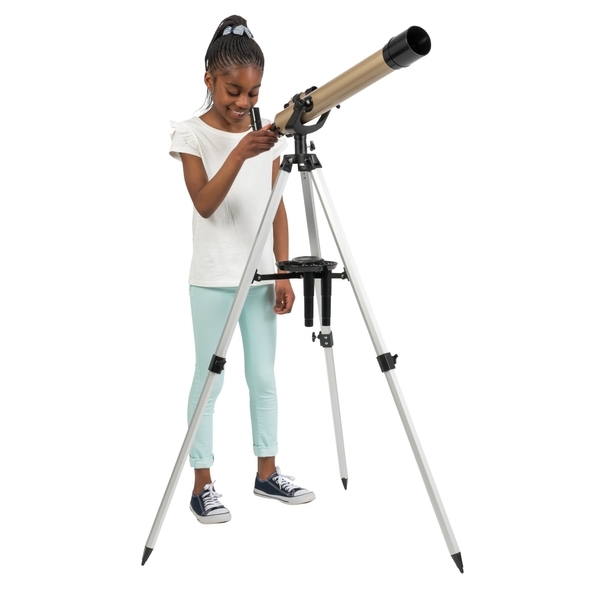 This 525x Refractor Telescope is both educational and fun. . The TM7060 has been designed to provide views of the moon's craters, Jupiter's major moons, and Satum's rings, in addition to dozens of galaxies, star clusters, and nebulae. As a terrestrial (land) telescope, the TM7060 delivers great views of mountains, valleys, and many other features of the world around us. You can also use the TM7060 to study animals and landscapes at a distance. With proper care and handling of your telescope, you will enjoy the pleasure of looking at nature's wondrous sights through the eye of this instrument for many years. It has a 60mm objective lens for great views of the moon, planets, constellations, and much more. High quality optical lens provide a range of magnification power from 30x to 525x and 5x24mm and an optical finder scope makes locating celestial objects simple. 1. Practice-Practice setting up you telescope when you are indoos and have lots of light. Then take your telescope outside. Viewing objects through closed or open windows is not recommended. Let your telescope adjust to the outside temperature as sudden changes in temperature can cause the lens to fog up. 2. Pick the right spot-choose the darkest spot available with the widest view of the sky you can find, moon-less nights are best for viewing the night sky as moonlight washes out deep-sky objects. Put the telescope on a flat surface. 3. Choosing your eyepiece- Start out with the lowest power eyepiece. This will give you a wider view of the sky so you can more easily find things. Once you have found an object you want to focus in on you can change to the higher power eye piece to get a closer look. Remember the lowest numbers have the highest magnification. Always be sure to remove the dust cap from the lens. 4. Remember to focus- Sometimes focus is hard to achieve especially at the higher magnifications or when viewing conditions are not idel. When this is the case the best way to focus is to slowly adjust the focuser knob until you have just passed best focus, then back up to the best focus.